The freak show is coming to MoMA. No, it’s not Marina Abramovic getting naked there again: Starting Wednesday, MoMA will for six months exhibit the okay-looking 1895 pastel-on-board version of Edvard Munch’s The Scream, the painting that made headlines last May when it was transformed overnight by economic alchemy from a work of art into “the most expensive artwork ever sold at auction.” That is, it was gaveled off for nearly $120 million to a “mystery collector,” rumored to be MoMA board member and Apollo Global Management CEO Leon Black. Should we be glad that this quasi-icon will be on view? That depends on what “on view” means. The Times reports that security will be “extremely strict.” I imagine highly timed tickets, as well, with massive crowds filing past the pastel like folks before a dead president as he lies in state. (As if MoMA isn’t crowded enough already.) MoMA director Glenn Lowry calls this “an incredible opportunity.” I can’t deny that it is. This version of the work has never been seen in New York — it’s been sequestered in a private collection for years and could be going back to one, for all we know. So it might not pass this way again in our lifetimes, if ever. 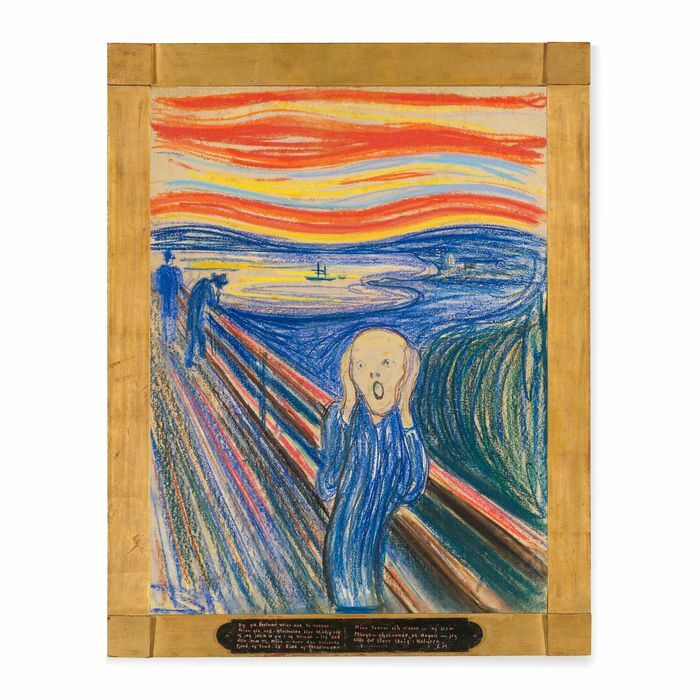 That’s a big deal, even if it really is Munch’s own copy of his original. At MoMA, the work will be exhibited with a very small scattering of Munch’s work: eight prints and two of his paintings from the same period. I revere Munch. I love the original version of The Scream. In that mad thunderclap, Munch condensed a new psychology into this image — one of anxiety, alienation, otherness. (Atop the painting, he penciled in the words ONLY A MADMAN COULD HAVE DONE THIS.) His amoebic figure is suspended between limbo and life, the outer and inner worlds. The image deserves its iconic status, as earth-shaker and as fridge magnet. And yet … I don’t want to argue against the chance to see this work in the flesh. Yet, a show like this — which is not a show but an event — here, now, is a case of MoMA indulging its spectacle-driven side. With (we presume) the best of intentions, it is flirting with the bad magic — the system that guarantees that obscene art prices are good for business. Perhaps they are. But we have to ask: Is that business, in turn, good for us? For art? I am not against collectors spending grotesque amounts on art. But I want it to stop mattering how much art costs, because price has nothing to do with quality, and talking about prices is totally boring. See you in line.